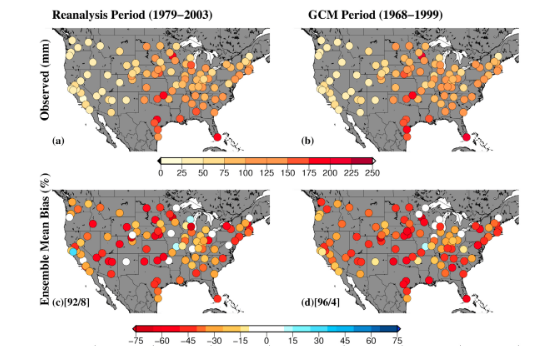 Home › Learn › Articles › Urban precipitation extremes: How reliable are regional climate models? Four (of 57) urban areas in India showed a statistically significant increase in the maximum monsoon rainfall. Changes in extreme rainfall in urban areas were often driven by large-scale climate variability. Figure 2. Performance of regional climate models (RCMs) in simulating 3-hour 100-year period precipitation maxima. Mishra, V., Dominguez, F., & Lettenmaier, D. P. (2012). About half of the human population lives in urban areas [Martine et al. , 2007] in contrast with only about 10 percent a century ago [Grimm et al. , 2008]. Due to large increases in population and built infrastructure, urban areas are emerging as ‘first responders’ of climate change adaptation and mitigation [Rosenzweig et al. , 2010]. Changes in extreme precipitation as the climate warms may pose challenges for stormwater management in urban areas, because most stormwater infrastructure was designed under the assumption of stationary climate that is “ dead” as argued by Milly et al. . The design of urban drainage systems is mostly based on precipitation and stormwater discharge with return periods ranging from about 5 to 100 years, corresponding to events with a probability of 0.01– 0.2 of occurring in any year. Because urban drainage areas are relatively small and have substantial impervious or semi-pervious fractions, their response times to extreme precipitation are usually short. Therefore, precipitation durations that control urban stormwater design usually range from less than an hour to a few hours at most. Hence, we focus here on sub-daily time scales. Consistent with observations [Dirmeyer and Brubaker, 2006; Mishra and Lettenmaier , 2011] most climate models project increases in precipitation extremes as the climate warms [O’Gorman and Schneider , 2009; Wehner , 2004]. Moreover, model-predicted changes in precipitation extremes are somewhat independent of changes in mean precipitation as they are largely controlled by variations in the atmosphere’ s moisture transport capacity [Allen and Ingram , 2002; Trenberth et al. , 2003; Lenderink and van Meijgaard ,2008]. Increased moistening of the atmosphere in a warmer climate could therefore lead to increases in extreme precipitation frequency and intensity, irrespective of changes in (seasonal and annual) means. Global Climate Model (GCM) simulations of future precipitation extremes generally show increases, which roughly follow the Clausius-Clapeyron rate of increase of atmospheric water holding capacity with temperature. Global climate models, which run over the entire globe and are self-consistent with respect to moisture and energy fluxes, are the primary source of information about possible changes in future precipitation. However, their spatial resolution (typically degrees latitude by longitude, equivalent to hundreds of km) is too coarse to resolve the processes that control precipitation extremes [SalathО et al. , 2010; Wehner et al. , 2009]. Furthermore, they are unable to resolve topographic variations that strongly affect precipitation and precipitation extremes in the Western U.S. Regional climate models (RCMs) provide higher-resolution climate projections that at least partially resolve finer scale variability associated with topography and land cover and hence are increasingly being used in studies aimed at helping society adapt to climate change [SalathО et al. , 2010]. Most previous evaluations of RCM-simulated precipitation extremes have examined seasonal or daily precipitation extremes at regional or larger scales [Gutowski et al. , 2010; Leung et al. , 2004; SalathО et al. , 2010; Wehner et al. , 2009]. The ability of RCMs to reproduce sub-daily precipitation extremes at local scales (which are most relevant to urban precipitation extremes) is still not well understood.